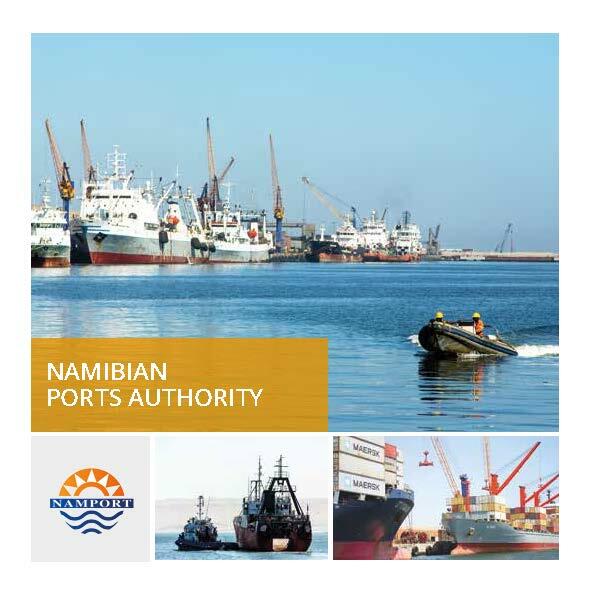 The Trans Kalahari Corridor (TKC) was jointly built by the Namibian and Botswana Governments in the 1990s with an initial investment of approximately N$850 million and was officially opened in 1998. 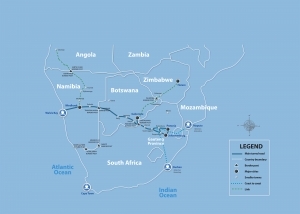 The Trans Kalahari Corridor is a tripartite trans-boundary corridor that stretches over 1,900 km along Walvis Bay-Windhoek-Gaborone-Johannesburg. 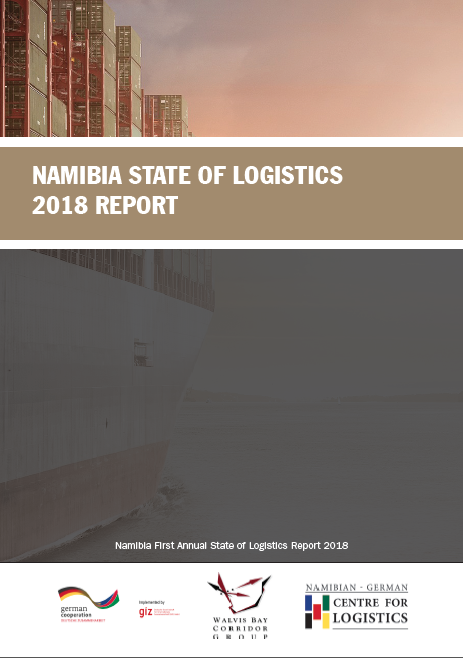 It is supported by a railway line from the Port of Walvis Bay to Gobabis (via Windhoek), where transhipment facilities are available, and continues from Lobatse in Botswana. 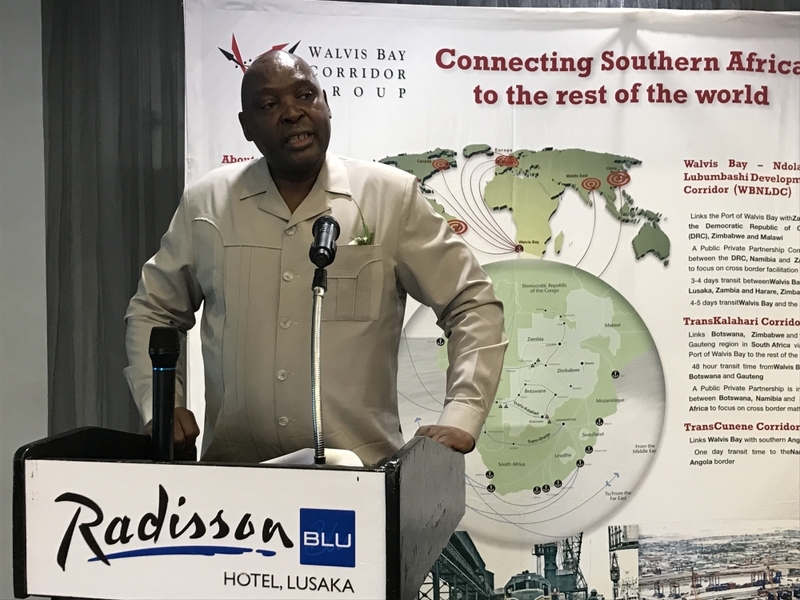 The Walvis Bay-Ndola-Lubumbashi Development Corridor (WBNLDC) links the Port of Walvis Bay with Zambia, the southern Democratic Republic of Congo (DRC) and Zimbabwe. 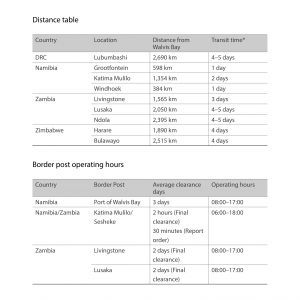 This corridor also connects via Zambia into Malawi and Tanzania. 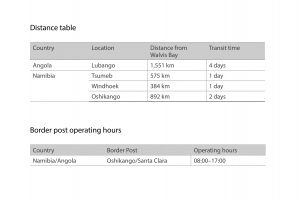 The Corridor runs via the former Caprivi Strip in north-eastern Namibia and enters Zambia via the Katima Mulilo bridge, which was completed in 2004. This development added to the existing WBNLDC, which was officially opened in 1999, resulting in the completion of the WBNLDC Corridor. 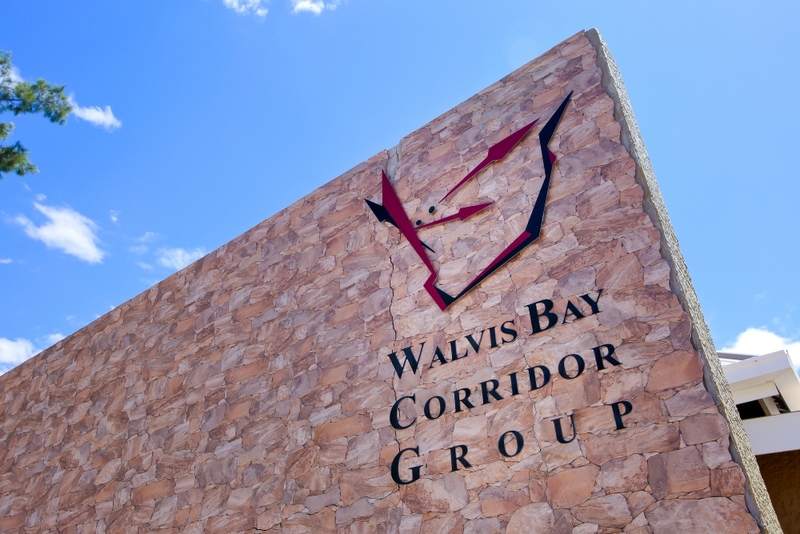 The corridor stretches over 2,500 km and is supported by a railway line between Walvis Bay and Grootfontein, where transhipment facilities are available. The railway line resumes in Livingstone, Zambia. The WBNLDC highway was officially opened in 1999. 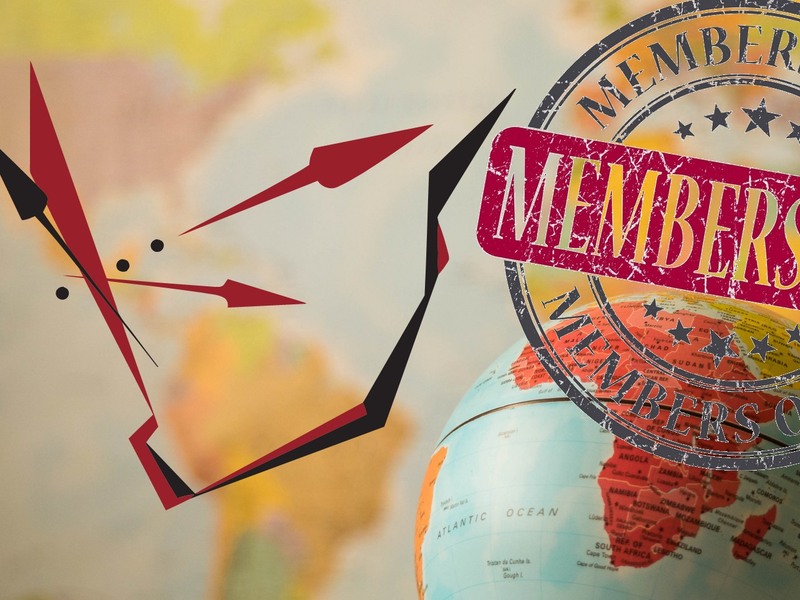 In May 2004, the bridge over the Zambezi River at Katima Mulilo (Namibia) and Sesheke (Zambia) was completed, which further developed what has now become the WBNLDC. 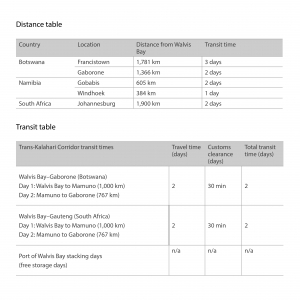 The Trans-Cunene corridor links the Port of Walvis Bay with southern Angola up to Lubango, over a distance of 1,600 km. 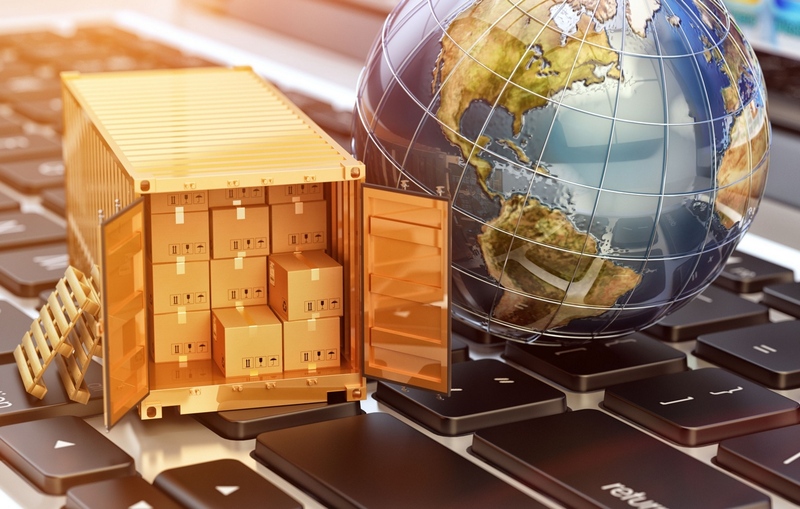 In May 1997, the Republic of Namibia and the Republic of Angola formally agreed to create the Trans-Cunene corridor as a means of opening northern Namibia and southern Angola to economic development opportunities. 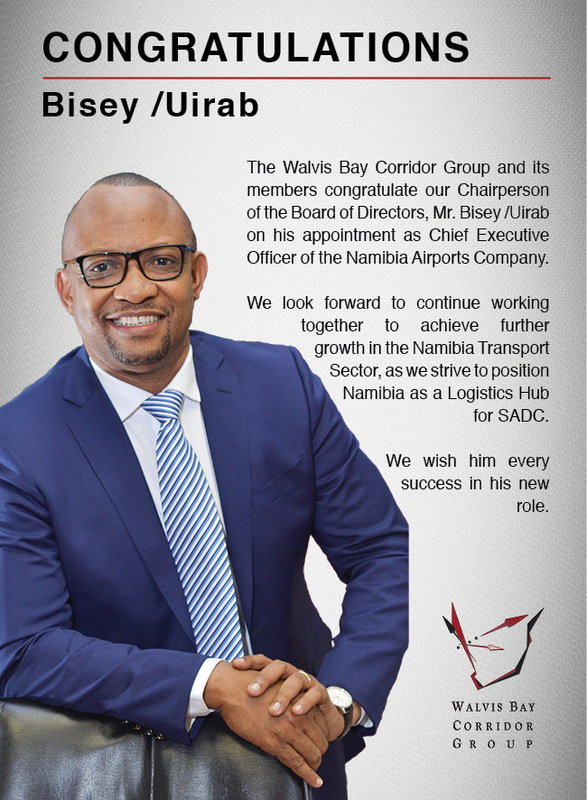 The Corridor road infrastructure is supported by the northern railway line, which presently extends from the Port of Walvis Bay to Oshikango. 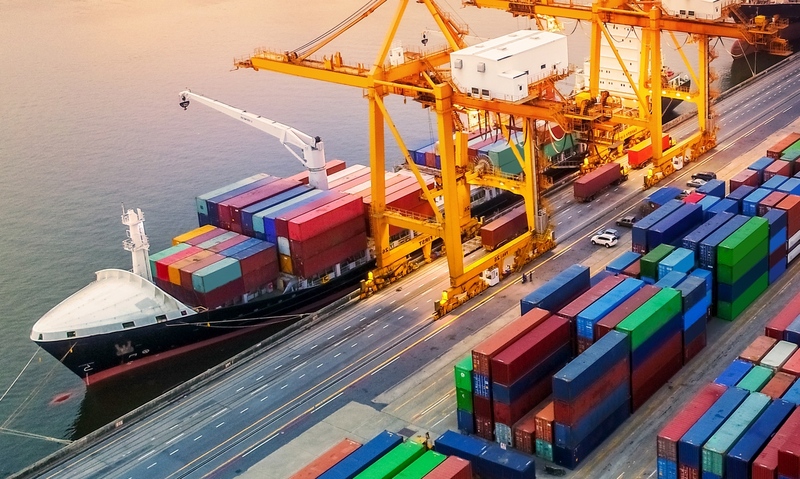 A further extension of the rail line across the Angolan border is planned, where Angola will extend their rail line to connect to this line. The Angolan Government is in progress with road rehabilitations nationwide, which include the Santa Clara – Lubango leg, as well as the Lubango – Lobito leg which extends the Trans-Cunene Corridor up to Luanda. 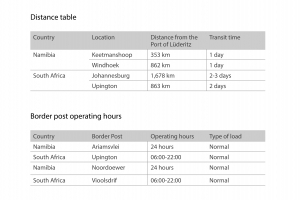 The Trans-Oranje Corridor (previously known as the Southern Extension) is a tarred road linking the Ports of Walvis Bay and Lüderitz with the Northern Cape Province of South Africa.